It seems month of March arrived with Asteroid written all over it. This month we had Two Asteroids which buzzed past earth Asteroid DD45 and Asteroid 2009 FH. Dear Readers do you remember the story of an asteroid on the day of Dassera Click Here for full article. In Breif : On 6th Oct,08 a Tiny asteroid ( between 3 and 15 feet or 1-5 meter in diameter) was discovered at Arizona observatory just hours ago for its reported entry into earth's atmosphere. Initially it was believed that the asteroid disintegrated during it entry turning into dust. At that time it was expected that none of the pieces of asteroid would survive to fall and be available as meteorite. Importantly serious danger was however ruled out. click here for the first and few animation(so far 10000 people have been reported to be seen this across the world) on this asteroid. So What exactly happened on 7th October 2008 ? This Asteroid streaked into the skies over northern Sudan in the early morning of October 7, 2008, and then exploded at a high 37 km above the Nubian Desert, before the atmosphere could slow it appreciably. It was believed that the asteroid had fully disintegrated into dust. So what is exciting about all above ? According to Douglas Rumble of the Carnegie Institution's Geophysical Laboratory, a co-author of the paper says it is common that many a number of meteorites have been observed as fireballs along with smoking meteor trails as they come through the atmosphere. It's been happening for years. But to actually know about such object before it gets to the Earth's atmosphere and then to follow it in – that's the unique thing. 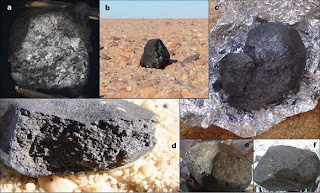 Macroscopic features of the Almahata Sitta meteorite: The meteorites from 2008 TC3, now called "Almahata Sitta," are anomalous ureilites: very dark, porous, and rich in highly cooked carbon. This new material may serve to rule out many theories about the origin of ureilites. a.Evidence of clasts in meteorite no. 7 (1 cm diameter) in a fresh fracture surface induced by pressure in the laboratory. b. Meteorite no. 15 (4 cm diameter), in situ, shows rounded shape of ablated surface.c. Meteorite no. 4 (14 g), placed on aluminium foil, shows the dark interior of a surface fractured upon impact.d. Meteorite no. 14 (237 cm), in situ, shows millimetre-sized grains in a weathered surface that was broken before impact. e. Back side of perfectly oriented meteorite no. 5 (10.9 g), with a front shell exhibiting thick radially flowing crust and a thinly crusted aft-shell. no. 16 (10 cm diameter). How were the pieces of Asteroid TC3 recovered ? Though it was initially believed the rock might not have survived to hit the ground. A Meteor astronomer Peter Jenniskens of the SETI Institute in California had thought differently. After establishing a collaboration with Mauwia Shaddad of the Physics Department and Faculty of Sciences of the University of Khartoum, he traveled to the Sudan. The two researchers, together with students and staff from the university, collected nearly 280 pieces of the asteroid, strewn over 29 km of the Nubian Desert. Peter Jenniskens says "Never before had meteorites been collected from such a high altitude explosion. As it turns out, the assembled remnants are unlike anything in our meteorite collections, and may be an important clue in unraveling the early history of the solar system". What made this object to Explode during its entry in atmosphere ? According to Jenniskens, the lead author of the Nature paper. This asteroid was made of a particularly fragile material that caused it to explode at a high 37 kilometer altitude, before it was significantly slowed down, so that the few surviving fragments scattered over a large area. Are the Pieces of Space rock from Mars or Another Asteroid or is it mystery ? Oxygen Isotopes can give the clues ? Oxygen isotopes in the meteorite give other information about its parent body. Each source of meteorites in the solar system, including planets such as Mars, has a distinctive signature of the three isotopes 16O, 17O, and 18O. This signature can be recognized even when other variables, such as chemical composition or rock type, differ. "Oxygen isotopes represent the single most decisive measurement in determining the parental or family groupings of meteorites," says Rumble who performed the analysis. According to Rumble's analysis, 2008 TC3 falls into a category of very rare meteorites called ureilites, all of which may have originally come from the same parent body. "Where that is, we don't know," says Rumble. But because astronomers took spectral measurements of 2008 TC3 before it hit the Earth, and can compare those measurements with the laboratory analyses, scientists will be better able to recognize ureilite asteroids in space. One known asteroid with a similar spectrum, the 2.6 kilometer-sized asteroid 1998 KU2, has already been identified by researchers as a possible source for 2008 TC3. Presently composition of such objects is determined by Studying the reflected sunlight which gives clues to the minerals at the surface of these objects. Then astronomers group the asteroids into classes, and attempt to assign meteorite types to each class. But their ability to do this is often frustrated by layers of dust on the asteroid surfaces that scatter light in unpredictable ways. Jenniskens teamed with planetary spectroscopist Janice Bishop of the SETI Institute to measure the reflection properties of the meteorite recovered from site , and discovered that both the asteroid and its meteoritic remains reflected light in much the same way -- similar to the known behavior of so-called F-class asteroids. Why this recovery is important turning point ? According to Bishop F-class asteroids were long a mystery. He further says Astronomers have measured their unique spectral properties with telescopes, but prior to 2008 TC3 there was no corresponding meteorite class, no rocks we could look at in the lab. Because of this recovery astronomers now know the good correspondence between telescopic and laboratory measurements for objects like 2008 TC3. This suggests that small asteroids don't have the troublesome dust layers, and may therefore be more suitable objects for establishing the link between asteroid type and meteorite properties. This knowledge would allow us to characterize asteroids from afar. Rocco Mancinelli, a microbial ecologist at the SETI Institute's Carl Sagan Center, and a member of the research team, says that "2008 TC3 could serve as a Rosetta Stone, providing us with essential clues to the processes that built Earth and its planetary siblings." Proper understanding of the nature of F-class asteroids could conceivably pay off in protecting Earth from dangerous impactors. The explosion of 2008 TC3 at high altitude indicates that it was of highly fragile construction. Its estimated mass was about 80 tons, of which only some 5 kg has been recovered on the ground. If at some future time we discover an F-class asteroid that's, say, several kilometers in size -- one that could wipe out entire species -- then we'll know its composition and can devise appropriate strategies to ward it off. Hitting such a fragile asteroid with an atomic bomb, as Bruce Willis might do, would merely turn it into a deadly swarm of shotgun pellets. Conclusion : Perturbed by the closest appraoch of two asteroid in march alone. My freind Pradeep Mohandas, President of SEDS India is on search of studies/tracking if any carried or deflection strategies done from india about asteroids. 2. How capable they would be to evolve a strategy (depending on the time available) based on true nature of such objects like TC3 2008 as seen above.